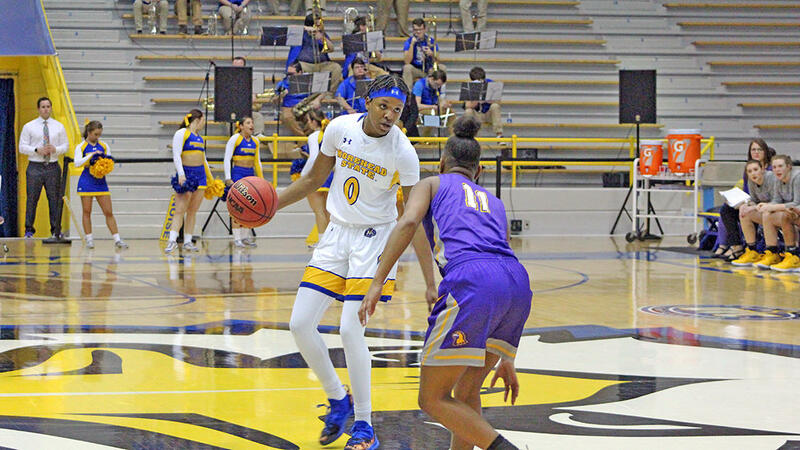 Junior guard Aliyah Jeune poured in 26 points and Senior guard Miranda Crockett chipped in another 20 as the Morehead State women's basketball team knocked off Tennessee Tech 77-56 on Thursday evening at Johnson Arena. The Eagles (14-6, 5-2) held Tech (14-4, 6-1) to its lowest shooting percentage of the season (.292) as they handed the visitors their first loss in Ohio Valley Conference play. "I'm very pleased with the way our team played tonight," said Morehead State head coach Greg Todd. "I thought we had great energy from start to finish and were able to cause a lot of trouble for an offense that had been potent against conference competition." Tennessee Tech opened the game with a hot 8-for-15 (.533) start from the field with five made triples to own 23-21 advantage after first quarter. The tide soon shifted as the Eagles defense locked down and held TTU to a 1-for-17 (.059) shooting mark in the second quarter. The hosts held the Gold Eagles scoreless until the 3:26 mark of the stanza and gave up a season-low three points to capture a 37-26 halftime lead. "I thought that the second quarter was probably our best of the season defensively," added Todd. Morehead State came out with more of the same defensive intensity in the second half as Tech was held scoreless for the first 2:15 of the third quarter. The TTU offense managed to find a rhythm following the bucket and trimmed the Eagles' lead to nine points at 44-35 with 5:11 remaining in the period after three-consecutive makes. Jeune answered the Tech offensive flurry with a pull-up jumper that sparked a 13-5 run close the third. The fourth quarter began with a 6-0 run to pull MSU ahead by 23 points. The lead extended to as many as 24 on two separate occasions in the final period. The Eagles finished the game 32-of-65 (.492) shooting and were 8-for-17 (.471) from beyond the arc. Jeune's 26 points led all scorers as the reigning OVC Newcomer of the Week buried a career-best tying six triples while hauling in six rebounds and dishing out five assists. Crockett's 20-point performance etched the Martinsville, Va., native's 25th consecutive game scoring in double-figures. Reigning OVC Player of the Week Tierra McGowan, who averaged 13.5 points and 13 rebounds in two MSU wins a week ago, cleaned the glass for 13 rebounds and swatted a season-best seven shots. The Eagles won the rebounding battle over TUU 42-40. "We can take a lot of positives out of a win like this," said Todd. "This was a great victory over one of the league's best teams but I think our squad still had room to grow and can improve going forward with hard work in practice." Morehead State returns to action on Saturday at home against Jacksonville State. The Eagles and Gamecocks are scheduled to tip at 1:05 p.m. ET.